looks: Selena has ice blue eyes that her friends discribe as beautiful and calming, and that her enemies would describe them as soul peircing and deadly cold. She has short black hair swept behind her ears except her bangs that hang on both sides of her face. There is a blue marking on the left side of her face from her time with traveling mages. She also has a grouping of scars she got when she was fighting a werewolf and scars from her shoulder to the back of her neck from a vampire. personality: She is quite and precise. Picking what she says and looking at everything at every angle. Along with her sword and spells she has a very sharp mind as her weapon. Books are one of her favorite ways to relax and unwind. Practice is very important to her, keeping her blade skills sharp (no pun intended) and magic is extremely hard to learn and hard to keep intact without it consuming you. Outside of battle or practice, she is very fun loving, kind-hearted, tries to see the good in everyone, quick to help. She is a very good listener, she won't quickly judge, try to see things from your persective. She loves most kind of humor, and she likes to joke around. She also gets along with guys better. Combat prefs: She wields a spell in one hand and a sword in the other. her favorite destruction spells are all elemental. Her glistening steel blade with a black handle thats engraved. It was blessed by her trainers. Her main go to spell is any lightning spell. She also carries a bow to deal with the unholy from afar. She wears both heavy and light armor, favoring both, depending on the climate and situation. Her two main armors are a light sash with a shirt under it with leather pauldrons, and her battlemage armor. Misc: She often finds herself playing with magic while thinking or being nervous. She does not discriminate when it comes to love. She also studies at the bard college when she has the time. Backstory: Selena never knew her parents. She was dropped off at the mages college when she was just a child. The college took her in and raised her as their own. At a very young age she had a aptitude for magic, often excelling whenever she was tested. At 18 she was very promising, close to harness the power not possessed by any of her fellow students. The two schools of magic she excelled in were destruction and restoration. After a year of extreme training, she began the training to become a witchhunter, a person who seeks out and destroys the unholy. After two years of that, she beacame a witchhunter. At 21 she decided to join a group of traveling mages that would set out and heal underprivileged, or far off towns, and to destroy the unholy. She loved helping people and seeing new places. For a while thats all she did, was stay with them and helped the land and it's people. After a while she got tired of it and went back to the college and studied. One morning Tolfdir payed selena a visit. They both had a father and daughter due to him, along with the other mages raising her. Tolfdir told her the story of how her parents were witchhunters as well, very good ones at that. After her father died, her mother knew that her daughter was not safe. So she asked Tolfdir to look after her, and tolfdir accepted. Selena's mother told tolfdir to tell her parents loved her very much and that they died protecting her whereabouts. The mother has not been heard from since. After that Selena cried for two days, questioning herself and her accomplishments. On the third day tolfdir gave her a certain, come and go pass to the college, knowing he could keep his young student caged. Selena thanked him and give everybody hug and went off to persue her fame, glory, adventures, and try to find her mother in skyrim. Dislikes:Politicians,politics,injustice,stupid people, arrogance, ignorance,two handed weapons, mudcrabs, and an unexplainable hatred for jesters. Personality: She is quite but personable. She pefers the company of her friends, a good book with a nice fire and good food,she loves to joke, have fun and train with her sword,bow, and mind.She is very warm and caring around her friends, especially around her loved ones(best friends and her family) She's precise when she is in battle. Especially with her bow. When an innocent is in need she tries to help. She may act all hard on the outside, but she is venurable on the inside. Her best friend is Ardin Wolf's-Bane and his brother, Hendrikk. Ardin and her are like brother and sister. Over ardin and avia's travels they became lovers. Combat Prefs: The bow is her death dealer. She has a couple favorite. The Nighingale bow she uses religiously.But her elven longbow, she cherishes and holds very dear. It was crafted by her village's most noble warriors and hunters. It was also used to protect her and her best friends during "the red sleep". She also has "Izanagi" her custom made sword. When she fights, she likes to have the first hit, being drenched in darkness.She is very fond of her armor. It has steel pauldrons, steel plated boots and gauntlets. She wears travel and sturdy clothes with the steel. Misc: she often twirls an arrow or a septim in her fingers, its something she does when she is thinking.. She leaves an offering for talos and kynareth. Her friends call her Ria (elven for hunter). She worships the bosmer gods whenever possible. She doesn't believe in ritualistic eating of human flesh, but does try to uphold the green pact. 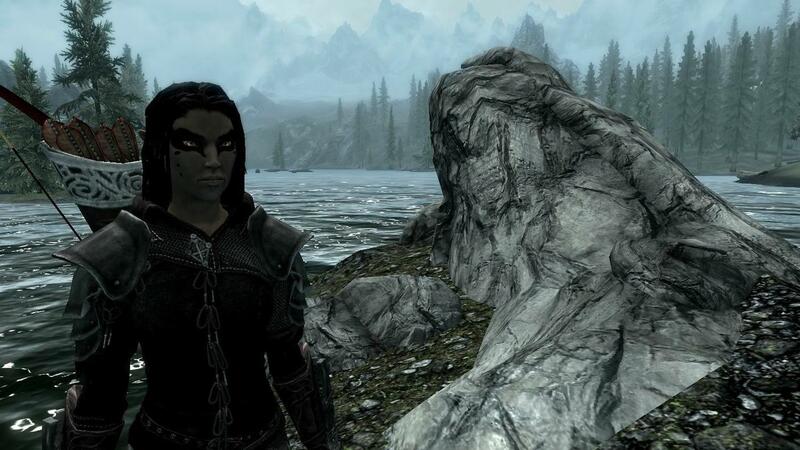 Family: Avia was born in a peaceful village in Valenwood. Her parents were both hunters, very good ones at that. At a young age she was taught how to hunt and effectively use the bow by her parents. She was a quite and shy child, mainly focusing on studies, practicing,reading,helping her parents and village, and climbing trees. At 15 she was extremely agile, and precise with a bow. Not to mention knowledgeable. Her dad taught her know to use a blade and how to hold the bow string back and how to use to utilize an arrow as a make shift dagger/stabbing weapon, and hunt, while her mom taught her how to "be one with the bow", and to use it in unconventional means. She also always give a quick death, thank, and use every part of an animal. "quick death for the merciful/begging foe and a slow death for the inhumane" was a saying her mother always told her. Both parents taught her how to read,write, exercise mentally, and helped her hone her mental fortitude. When she turned 18, they moved to Cyrodill to avoid the wild hunt, they didn't want Avia to see what the hunt did to their people. for three years they lived in Cyrodill, prefering warm cities that remind them of the weather back home.However they saw injustice, unlawful rulers,corrupt officals and so on. The thieve's guild in cyrodill exposed Avia to this. From then onward she swore only to steal from the rich(or those who deserve it, in which that case she keep the gold) and give to the poor. 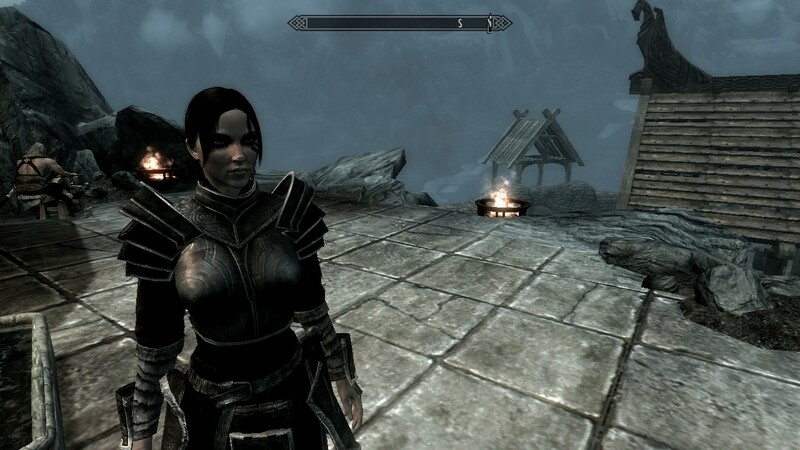 Avia actually liked the cold in bruma. They lived a very peaceful and happy life. Cael'til(the father) still got to hunt and provided for his family and Ama'tae(the mother) can still spend time with avia, and look after the house and take care of it. Not to mention she can still hunt. Avia loves her parents very much.She's a daddy's girl through and through, but she still has some momma's girl as well. After a little while after her third year,she decided to move to skyrim to experience another land and just to explore, so she packed her essentials, some gold she earned from running with the thieve's guild,and kissed her parents goodbye. Her Time in the thieves guild:A few months after she arrived in skyrim she found herself in a tavern listening in to two nords talking about the thieves guild. She was very interested, and decided to find the thieves guild in the ratway. There she met people with the same fondess of the bow, agility, cunning and intelligence. She excelled in most areas,loved her time there and rose to become guild master a year later. She trusted Brynjolf there to look after things while she is gone. She didn't stop there however. The Traveling Sword: At age 23 she was in town when she over heard about a traveling order called "The Traveling Sword"(shortened as The Sword) a group of warriors that travels from place to place and corrects injustice.Even though she was(still is) in the thieves guild, she still wanted to join this order. She only steals from the rich and gives to the poor, and only keeps the money from the "personal"jobs (she would have to not like them.She would keep a small percent from the other jobs). There she met people from all walks of life. She met an Orc warrior, a reguard spellsword, a nord warrior, a Khajiit archer with two elven daggers,a breton healer with a nac(and Obsession really) with daggers, a dark elf spellbow, and two young strapping nords by the name of Ardin and Hendrikk Wolf's-bane.Ardin and Avia grew very close over the years.They have a "romance enkindling". The sword has gone all over Tamriel. From Skyrim to Cryodiil, and Cryodill to Morrowind, Morrowind to Hammerfell, Elsweyr, and every place in between. They loved the adventure and bringing peace and justice to places where the law ignores or isn't present.They often deal with corrupted officials, bandits, theives. A few times they even dealt with a elite group of mercenaries called "The Black band". The black band consists of warriors, mages, archers, and just flat out psychopaths. The black band is leaded by Jullius"Wolff" aventius, an imperial veteran from the great war that was discharged for his war crimes. "The red sleep": On a cold night, the group set up camp, told stories of triumph, love,humor, lust, and horror(both are Avia's favorites).They also ate, sang, drank. Finally after some time, they all finally fell asleep. Thats when it began. a scouting party of the black band was stalking the sword for quite some time. After the battle at mistwatch, the black band wanted blood. Both sides lost men. The scouting party was made up of two archers, an breton rogue, a nord warrior, Wolff's second in command, Hemsley Cold-eye and Wolff himself. Cold-eye served with Wolff many times, both as animalistic as they come, they were tried at the same time for their war crimes. The archers took care of the sentries with one shot each, then the rogue came in to deal with any sleeping guard, guards to far in the camp, and the sleeping members. The breton rogue loves blood, and the feel of the blade against the skin. The Rogue started off with dar'zhii the Khajiit, solely based off hate. She made it a slow but clean kill, sinking the blade deeper than necessary. She then made quick work of the orc knowing he would a hassle and impossible to kill. The archers had already killed Cristar(the nord) and dar'zhii, and now Lhorbul. The breton put the knife to Avia's throat, and was about to slice. Avia felt cold steel against her neck but thought it was the cold night or a dream. that night she dreamed of the warm summers and springs of home, hunting for the first time with her family, the family dinners they had, and her first kill. she didn't know it, but her life was going to flash before her eyes. She felt a hand over her mouth and slammed her eyes open. She was about to be killed! Then all of a sudden the rogue stopped, then fell to the floor face first. All she saw was ardin, and the rogue with a steak knife in her back. "Get up, we're being attacked, Grab your weapons! "Ardin said shouting while getting his sword. Avia got up, put on her main armor parts,grabbed her bow, and went on to fight. She and Brinala(the redguard) decided to take out the archers, then any stragglers.The raged on until there was only The surviving sword members, Hemsley cold-eye, and Wolff. After Avia and brinala were done fighting, the turned to the sight of Ardin on the ground bloodied and Wolff above him. Avia was about to turn when all of a sudden Ardin stabbed wolff. He crouched in pain and that gave Ardin enough time to get up, grab his sword, and with a slight pause for last words, he hacked Wolff's head clean off. Hendrikk was more merciful, sending Hemsley without a hand. Prairie fire of sun's dusk:The fight was over and the sword had won, it was time to go back home( Ardin and Avia would make the trip to valenwood to sharpen his archery skills and to "drop off" Avi.) But what they came home too, was nothing but horrific. Ardin's home was on fire his dad fighting four mercenaries, and turn his father was struck down. His mom tried healing Odvar, but was killed by Hemsley himself. Ardin, Hendrikk, and Avi fought and killed everyone even hemsley. In the end all they have is each other. After all that Ardin and Avia decided they needed to take a break for the sake of hiding and safety from the black band. The black band hasn't found them or tried to since. After all of that the trio decided to split up and adventure and hide alone, only when the black band was wiped out or disbanded, can they see each other. Looks: Ardin is a mountain of a man, 6'6, 240 and one hell of a pain tolerance. He has black hair down to his neck with four braids, two on each side, he also has a large scratch across the rightside of his face. His brown eyes are very loving and comforting to his friends,fiery and strong to his enemies. His hair and facial are well kept. Misc: Lots of stories surround the last name. 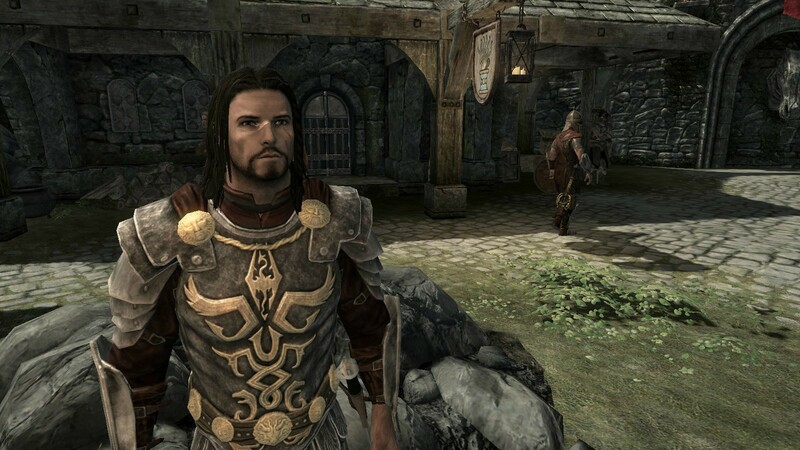 Some say he fought a pack of wolves off, some say he was a illegimate son of hircine, some say he fought off a werewolf(Story varies based off who you ask. The weapon often's changes, in some cases it was his bare hands, others his sword, and even some with a tree branch! (ardin's favorite). Ardin has a brother. His brother's name is Hendrikk, they were quite close, always having each others backs in and out of battle.His best friends is Avia'Cael, a wood elf he met while in Valenwood scouting and sharpening his archery skill. Family history:Ardin was born to a family of warriors/healers. His father fought in the great war while his mother was a healer in it as well. Thats how Odvar and Aliea met. They have been in madly in love ever since. Ardin at a young age showed interest in reading, the sword and bow, and writing. Now his father showed him all he knew in sword combat and some in archery whereas his mother taught him how to read and write. The Traveling Sword:Ardin joined a pack of roaming warriors and law bringers called The traveling Sword( often shortened as "The Sword"). There he met a handful of warriors, archers, and so fourth of like minded people who believed in justice and protection of innocents that were ignored by the law. He also met his best friend Avia'Cael, a female wood elf that saw injustice daily in Valenwood and in her travels.Over the times and years, Avia and Ardin became very close. There was people from all walks of life, an Orc warrior, a reguard spellsword, a nord warrior, a Khajiit archer with two elven daggers, Avia'cael, a master with the bow and her blade, Breton healer with a nac(and Obsession really) with daggers, a dark elf spellbow, and Ardin himself. Ardin and Avia grew very close over the years. They have a "romance enkindling". Their travels took them far and wide, from Skyrim to Cryodiil, and Cryodill to morrowind, morrowind to hammerfell,Elsweyr, and every place in between. They loved the adventure and bringing peace and justice to places where the law ignores or isn't present. They often deal with corrupted offcials, bandits, thieves. A few times they even dealt with a elite group of mercenaries called "The Black band". The black bands consists of warriors, mages, archers, and just flat out sadistic animals. The black band is leaded by Jullius"Wolff" Aventius, an imperial veteran from the great war that was discharged for his war crimes. "The red sleep": On a cold night, the group set up camp, told stories of triumph, love,( both are Ardin's favorites) humor, lust, and horror.They also ate, sang, drank. Finally after some time, they all finally fell asleep. Thats when it began. a scouting party of the black band was stalking the sword for quite some time. After the battle at mistwatch, the black band wanted blood. Both sides lost men. The scouting party was made up of two archers, an breton rogue, a nord warrior, Wolff's second in command, Hemsley Cold-eye and Wolff himself. Cold-eye served with Wolff many times, both as animalistic as they come, they were tried at the same time for their war crimes. The archers took care of the sentries with one shot each, then the rogue came in to deal with any sleeping guard, guards to far in the camp, and the sleeping members. The breton rogue loves blood, and the feel of the blade against the skin. The Rogue started off with dar'zhii the Khajiit, solely based off hate. She made it a slow but clean kill, sinking the blade deeper than necessary. She then made quick work of the orc knowing he would a hassle and impossible to kill. The archers had already killed Cristar(the nord) and dar'zhii, and now Lhorbul. She then moved on to Avia. The blade met Avia's skin, the rogue raised her hand, but she stopped. She felt a sharp pain in her back, there was a steak knife in her and Ardin after he threw it. It was all hell after the fighting began. Ardin grabbed his sword and sank into the rogue. At this point Hendrikk and the surviving members. Hendrikk was fighting the black band's warrior while Avia and Brinala(the redguard) took care of the archers. More came, more died. After some time, there was just the sword, Wolff and Hemsley. The redguard charged in and Ardin blocked with his sword pushed him back, and then hacked his head off, no challenge at all. Ardin shifted his attention to wolff, while Hendrikk fought with hemsley. " You think you can kill me, you filthy nord? ", Wolff said to Ardin. " I killed five of your guys last time. Not to mention my friends and brother's kill count" wolff charged swinging his glass war axe, Ardin was moving and swaying like it was nothing. Then Wolff just started landing swing after swing, Ardin did block a few, and sliced wolff's leg, but Wolff got him in the leg and chest. Wolff started taunting Ardin by hitting him with the broad side of the sword, and just deflecting the hits he dished out. After a long battle, Ardin got the upper hand and right as wolff was about to sink his blade into ardin, Ardin grabbed a tree branch, blocked the attack and stabbed wolff through the leg. He rose up and put his sword to Wolff's neck. Wolff muttered these last words," Even if you kill me, I have already won in the end" and with that Ardin sliced off his head. Hendrikk on the other hand, was more merciful, sending Hemsley out without a hand. The Last Warbander likes this.